33/43 Kim Hollis I was mostly bored throughout this film. 67/98 David Mumpower My wife was asleep long before the fight between Michelle Yeoh and Jet Li occurred. I think that says it all about a well-natured but mediocre sequel to a franchise I really enjoy. 146/196 Max Braden I never thought I'd say this, but Maria Bello is a poor substitute for Rachel Weisz. 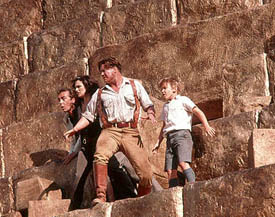 In 1999, Stephen Sommers embraced the task assigned to him by Universal Studios. The writer/director re-introduced one of the linchpin characters from the glory days of Universal, The Mummy. Sprinkling in a dash of horror with a ton of ideas straight out of the Indiana Jones playbook, Sommers created one of the best action adventure movies of the decade. Audiences were captivated by the stimulating visual effects as well as the upbeat nature of the tale of Rick O’Connell's attempts to stop the evil titular character from enslaving the world. Along the way, he also managed to seduce the perkiest Egyptologist on the continent, Evie Carnahan. A good time was had by all as the well-intended swashbuckler earned $155.4 million and $413.5 million in total worldwide receipts. The blockbuster success of the first film could mean but one thing. The Mummy was less dead than previously indicated. After all, a deceased member of the undead could earn no further money for Universal Pictures. Also, by definition, the undead don’t stay dead. And how did it do? Well, it would be an understatement to say that the movie’s opening weekend was a pleasant surprise. The first weekend of May in 2001 saw The Mummy Returns open to $68.1 million. While that may not seem like much now, no longer qualifying as one of the 25 largest openings of all-time, it was a pretty big deal then. In point of fact, The Mummy Returns missed becoming the biggest opening ever by only $4 million, and happily settled for being second all-time. Sure, that number was surpassed twice by the end of the year, but at one point within this decade, The Mummy franchise had staked a claim to being one of the two biggest opening weekends ever. The sequel quickly ran out of steam, eventually earning $429.5 million worldwide, not much more than the first one. Even so, how many sequels exceed the original when the first one is a blockbuster? The problem Universal Pictures faced in developing another project was that neither Brendan Fraser nor Rachel Weisz was particularly excited about immediately returning to a franchise they had just spent the body of four years making a monumental success. The only other choice, Arnold Vosloo, also wouldn’t work as The Mummy because that character had unfortunately chosen this point to undo his existence. So, that sequel idea was no good, either. A plan was hatched to develop a project using a tertiary character from The Mummy Returns and thus The Scorpion King was born. This author likes The Rock, so there will be no jokes about the decision to cast the wrestler as the lead actor in what had been a successful franchise. We’ll simply cut to the chase and say that this title earned only $165 million worldwide, though the good news was that the budget was only $60 million. So, the project was technically a success. Technically. Time has passed and in the years since 2001, a new idea has come to fruition. The Mummy creature from The Mummy may not be available, but he’s just A mummy. There are other mummies out there. For instance, China is a well known habitat for mummy residence. Enter Jet Li. That’s right, folks. The action star who recently retired from the world of martial arts combat movies has not quit the action genre altogether. To the contrary, he readily embraced the idea of becoming the new and improved mummy. Thus, The Mummy 3 became a reality. The premise this time is that a nefarious sorceress named Zijuan (played by BOP fave Michelle Yeoh) has cursed a Chinese mummy to an uncomfortable existence. The good news from the undead Emperor Han’s perspective is that his curse allows him to change forms, making him a seriously dangerous sumbitch. This is bad news for Team O’Connell. While trekking through the Himalayas soon after World War II, Rick and Evie along with their now-adult son Alex encounter Team Evil, and the face-off leads to hijinks throughout China. The one key plot detail that has been leaked so far is that there is a mis-en-scene involving the infamous terra-cotta warriors of Xi’an (as seen on The Amazing Race and referenced on The Simpsons!) as they come to life in order to protect the life of their ruler. With regards to the changes from The Mummy Returns to The Mummy 3, there are some big alterations. Rachel Weisz, fresh off of winning an Academy Award, declined an invitation to return to the role of Evie. Another actress with indie cred, Maria Bello, will replace her in portraying the same role. As mentioned previously, Alex is no longer a kid, so Luke Ford of The Black Balloon has been cast in the role of him as an adult. The Mummy franchise once again takes a play out of the Indiana Jones playbook with this move, accidentally making Brendan Fraser the decrepit Sean Connery in this scenario. Jonathan, Evy’s brother, also returns and actor John Hannah will reprise his role. Oded Fehr has stated that his character, Ardeth Bay, will not return, though that’s probably fluid. See the latest developments for this project on the The Mummy: Tomb of the Dragon Emperor Movie News page.